Clockwork Hart performed the Dolls Of New Albion at the Edinburgh Fringe Festival this year. 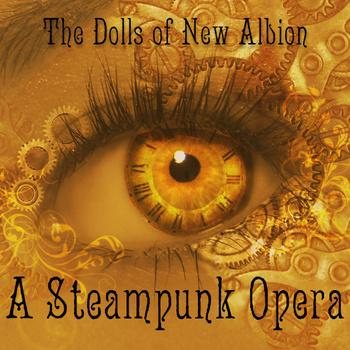 They performed the opera at theSpace @ Venue45 on Jeffrey Street, Edinburgh, (Venue 45) between the 11th and 16th of August.A Steampunk Opera is a 90 minute, 4 Act story which follows four generations of McAlistairs in the fantastical city of New Albion. This was a stage musical adaption of Paul Shapera’s album of the same name, a musical in four acts which follows the different generations of the star-crossed McAlistair family. It opens with lonely scientist Annabelle who revives her dead love Jasper in true Frankenstein panache. She places her love in a life sized mechanical doll and it is this ill-fated action which sets into motion a downward spiral of melancholic consequences which transform New Albion forever. As generations pass, the dead roam the city. This is a story of love and sacrifice. I enjoyed this intense performance held in a fairly intimate space. The actors gave a praiseworthy performance, the narrator was ardent and the doll was charmingly forlorn. The dancing was curiously appealing and well suited to the nature and feel of the musical. I enjoyed the story and the manner in which the narrator gave us her rendition of it. The cast was solid and enjoyable to watch. I feel the song in the first act sung by Annabel (Annabel’s Lament) went on a bit too long and cut into the flow of the musical perhaps the line ‘you could have been my angel’ was just repeated too many times, but I found myself wishing that particular song would end. This is not a criticism of the performers, but the construction of the song. Having said that I don’t dislike the song and I enjoyed most of the songs in the musical despite this. Annabel McAlistair – The third song of the musical opens with Annabel in her private lab where she is attempting to animate a mannequin/doll. Annabel is a bit of a mad scientist, but she exhibits an intense loneliness. According to her background notes, she was raised by Ayn Rand obsessed parents who prized achievement over the development of social relationships. Annabel was discouraged from social bonding on nobodies and after she had risen to the stop of her field in science she would be able to socially bond with other greats in her field. Because of this Annabel has developed a rich inner fantasy life where she fancies she is having a romantic relationship and this is her only way of fulfilling herself emotionally. Her feelings of self-worth are intimately tied with her level of achievement. While she does not necessarily agree with her parents’ philosophies, she is a product of them nonetheless. Annabel spent her awkward college years basically on her own however she was deeply in love with a boy named Jasper from a distance of course. He was scarcely aware of her. After 2 years, she finally gets a chance to spend one romantic evening with him, although he is frustratingly betrothed to another. After this Annabel gets expelled from school because of disagreements with her professors. She has a theory and she is stealing corpses to test it. Her parents were perfectly pleased, believing that any individual of any great potential must inevitably conflict and be shunned by a mediocre world. However, they die within a year of Annabel’s expulsion.She is left with a large property with a lab and a large sum of money and with this she performs endless experiments. This isolation does not feed her self-worth and she becomes troubled instead of ultimately content. Over the years she keeps tabs on Jasper and is shocked to learn of his death. However she has been experimenting and she believes she can bring him back to life in the body of a doll. Edgar McAlistair arrives in the 2nd Act. Edgar is Annabel’s son. She eventually married. Edgar grew up far more enamoured of his mother than his meek and boring father. In fact he worshipped her. Because she used to lock herself in her lab for days on end, she became like a drug for her son who sought her attentions. Annabel died when Edgar was 11 after which his father raised him. However the loss of his mother is unbearable to Edgar. Unlike other adolescents, Edgar is very focused and rigidly monogamous. In his 20s he meets Fay, an exceptionally bright young woman. Edgar’s attractiveness, intelligence and unswerving loyalty were the right combination for her and they fall in love and remain together for several years. Edgar has no idea what to do with himself. While he has an ability for tactical brilliance he is not able to become interested in a task for any length of time. This drives Fay crazy and is a problem in their relationship. heart towards him. She eventually meets someone new and abandons Edgar for him. Jasper, The Dead Guy – appears in all four Acts and is present in all four generations which the show encompasses. Jasper who dies before the Opera ever begins. Jasper hails from a well respected family, once extremely well off but now not so much. Jasper is pressured to restore the family’s respect but he doesn’t care about this. He has other plans and falls out with his family over this. He has an arranged marriage which he is obligated to, although he met Annabel just prior to this taking place, although he soon forgets her. His marriage is an unhappy one, his wife is vain and shallow. She is not interested in Jasper’s interests and is only focused on restoring both their familie’s fortunes. Eventually Jasper becomes a stockbroker but sabatoges himself due to resentments he holds on his mother and wife. The only bright light in his life is the birth of his daughter Fay. And he dies while she is young. He is somewhat surprised and not very pleased when Annabel brings him back from the dead. He is even less pleased when Edgar brings him back again later, but is calmed when he realises he can see his daughter again. Byron McAlistair is the son of Edgar and Fay, growing up with enormous wealth. Byron loves his mother but despises his father. Edgar ended up together due to some nasty coercion on Edgar’s part and the marriage is failing as does her fondness for him. It is his mother Fay who convinces him the awful marriage is the fault of Edgar, his father. Byron has found no contentment in his wealthy upbringing and is passionately rebellious against his father’s world, which he would love to tear down. Like most angry young men, he sees a world full of hypocrisy and greed, the Voodoo-punk subculture is perfect for him and he immerses himself in it completely. Jasper, the doll that Edgar brought back for Fay and who is also the man that Annabelle originally brought back, was Byron’s closest childhood companion and his attachment to his Doll Jasper is unhealthy. Naturally, in Byron’s love for Jasper is wrapped up his misplaced love for his father. Unable to love his father out of resentment, Jasper’s hyper passivity is the perfect antithesis to his father’s active power and influence. Jasper’s inability to show love back despite that Byron knows he’s in there is like a drug to Byron. Thru the voodoopunk movement Byron can find communication not only symbolically of Jasper, but with a mind blowing array of archetypal spirits. Byron obsesses over Jasper and his voodoopunk movement. He never has a real boyfriend and his interest in men is purely sexual, never forming any type of intimate or emotional bonding. Byron is charismatic however he is not actually close with anyone. Only Amelia considers him a friend. Amelia is perhaps the only (living) person other than his mother Byron has ever formed any sort of true in depth emotional intimacy with. He cannot sustain this and can never be what Amelia is seeking and this ultimately leads to their downfall. Priscilla McAlistair – Final Act. Priscilla McAlistair is the daughter of Byron and his trophy wife, Charlotte. Although gay, as a popular politician it was in Byron’s best interest to be married, and Charlotte was willing. She was not blind at all to Byron’s lack of sexual interest in her, he could give her a child, which she wanted very much. A child and a secure, posh environment to raise it in. During Act 3 the city suffered a large amount of damage and order was restored by the imposition of martial law, which was never lifted. This was of course the very thing Byron had been decrying and railing about. He became even more rabid and it was while Priscilla was only a toddler that the police came to “ask him some questions” one day. He never returned and Priscilla never really knew him. Charlotte raised Priscilla on her own, but became more nervous, fragile, and finally unhinged as time went on. After taking away her husband, the police not only watched her closely, but applied a great of deal of pressure and intimidation on her at every turn. Thus Priscilla grew up with no father figure, an increasingly nervous and lonely mother, and in isolation. She had Jasper the Doll. She found him snooping about the large manor house. She finds him when she is around 11 and became attached to him. He was her primary friend and she had few friends outside. She spends her days shut in a house with a nervous mother and a harsh martial environment outside. Jasper served as his friend and father figure. Jasper is actually Priscilla’s great grandfather and she is the first McAlistair he has any real emotional attachment for. Priscilla has a keen intellect and is self-taught. She is a happy recluse, favours fantasy and the company of a dead mechanical doll. Her mother is carted away to a mental institute while Priscilla remains in the house with Jasper to keep her company. They begin to play cards to pass the time.